There’s a lot to love about these stunning silver and peridot wrapped earrings. The Swarovski crystals are flanked by silver beads and appear to be curving around the edges. The bicones are wrapped onto one shiny silver wire that comes together in double loops at the top. Simple yet sophisticated, this project is not time consuming or expensive to make. If you have ten crystals left over from another project, you’ve got the start for these elegant treasures. step 1 - Cut two lengths of 18 gauge round wire to measure 5”. Mark the wire 1” from both ends with a Sharpie. Cut two lengths of 22 gauge round wire to measure 22”. This will be your wrapping wire. 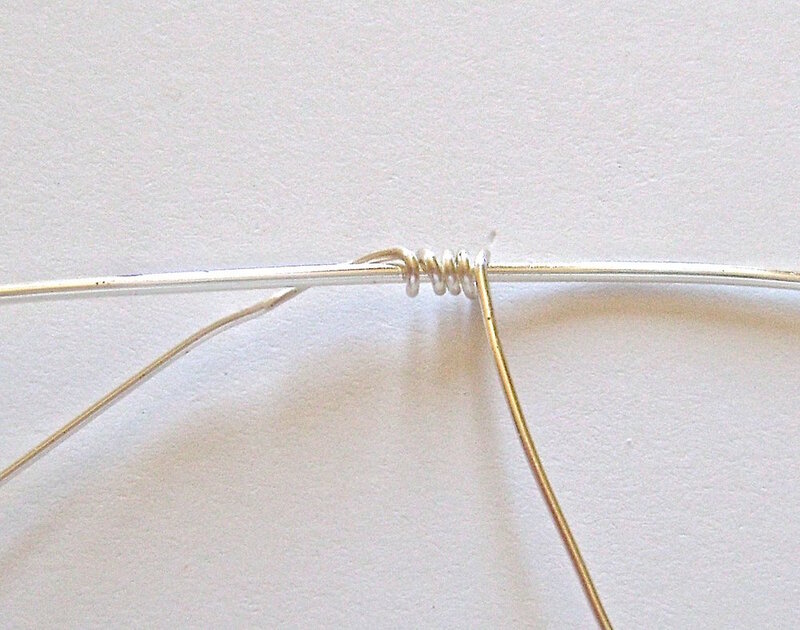 step 2 - Place the center of the wrapping wire at the center of the 5” wire. Wrap the thinner wire around four times. step 3 - Add a silver bead, bicone, and another silver bead to the right side wrapping wire. step 4 - Hold the beads against the wire to keep them from moving and wrap the free end around the 5” wire four times. step 5 - Continue wrapping and adding beads until you have three sets attached to the 5” wire. Do the same with the left side wrapping wire adding only two sets for a total of five sets. step 6 - Wrap one end of the 5” wire on a large section of mandrel. Curl the wire until it is aligned with the Sharpie mark. step 7 - Wrap the other end on a smaller section creating a smaller size loop than the first. Slide the beads across the 5” wire so that the center bicone is in the center of the wire. Use a Q-tip and rubbing alcohol to remove the black marks. step 8 - Bend the 5” wire against a large magic marker with the center bicone in the center of the marker. step 9 - Bend the 5” wire against a large magic marker with the center bicone in the center of the marker. step 10 - Be sure to wrap around the raw edges of the 5” wire to conceal them. If necessary, trim excess wire from the small loop end. Stop wrapping 1/4” from the center top of the earring. Cut off excess wire and smooth the end with pliers. Step 11 - Wrap the left side of the earring in the same way. Attach an earring wire to the center top of the earring. Step 12 - Make the second earring with the loops facing the opposite direction.